Aussie homewares brand Salt&Pepper has teamed up with renowned chef and MasterChef judge, George Calombaris, for a new cookware collection. Aptly called GREEK, the range includes six essential items that work on all cook tops including induction. Working closely with Salt&Pepper, Calombaris was heavily involved in the development process to make sure he was happy with the end result. 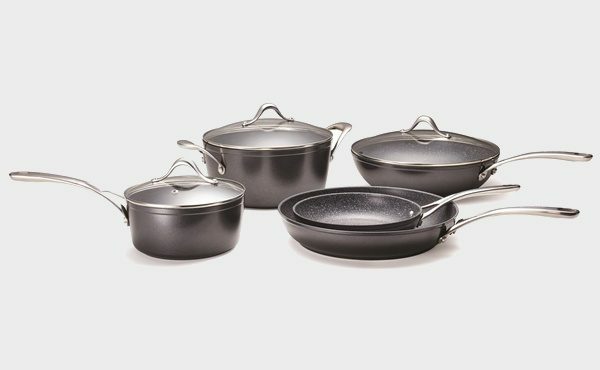 The new range uses a multi-layer QuanTanium non-stick coating, which is well known for its non-stick capabilities. This means you don’t need oil or butter, making cooking healthy meals so much easier and more enjoyable. It also means you can cook delicate foods that are prone to sticking like fish or eggs. Additionally, GREEK is much harder and sturdier because the items are made from hard-anodised aluminium, so they won’t damage easily if you are a bit rough with them. The collection is available in stores now. What are the design trends for 2019?